I've made fleur de sel caramels in the past (a must try by the way), and was eager to try this recipe out. The honey flavor really comes through in these, so be sure to use a honey that you enjoy. It's been a while since I've had caramels, but I think these were a bit on the sweeter side. You could definitely cut back on the sugar a bit and probably not miss it too much. These would probably be good with a little fleur de sel or sea salt sprinkled on top, too, to counter some of the sweetness. I lined my pan with foil and buttered the foil, instead of pouring the caramel directly into the pan - a trick I've found to be most useful when it comes to clean up! I did learn the hard way, however, that the mixture bubbles up quite a bit as it comes up in temperature and almost ended up with caramel all over my stove because I used a saucepan that was too small! Next time I'll definitely use a 2 quart saucepan. Otherwise, this recipe went off without a hitch and I had no issues cutting the caramel into squares. I found the caramel to be so easy to work with that I didn't even have to butter my knife to cut it. Thanks Carmen, for hosting this week. If you'd like the recipe, you can find it here. 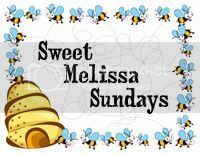 Make sure you check out the Sweet Melissa Sundays Blog Roll to see how everyone else enjoyed this sweet treat! If you haven't already, don't forget to enter my giveaway here before it ends on April 11th. - Make sure you use a large saucepan (at least 2 quarts) because the caramel really rises up when it starts boiling! I used a 1.5 quart saucepan and it nearly boiled over! - Consider removing your pan from the heat as it approaches 250F because the temperature may continue to rise a few degrees after you take it off the heat. If it doesn't get hot enough after you take it off the heat, then you can always put it back on the heat. - Line your pan with foil and then butter the foil to make clean up easier when you're done. I loooove making caramels! These look fantastic for Easter too. Thanks for stopping by my blog. One can never have enough caramel! 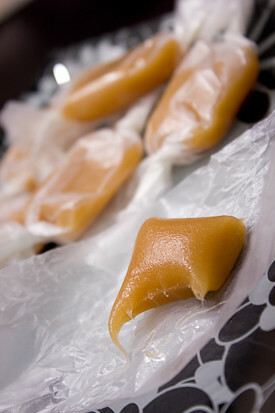 I love homemade caramels, but never make them..probably because of my fear of the candy thermometer. Oh my holy moly! I want these right now!!! My Mom made caramels for Christmas and we couldn't get them out of the waxes paper afterwards. Did these stick? They look so yummy! 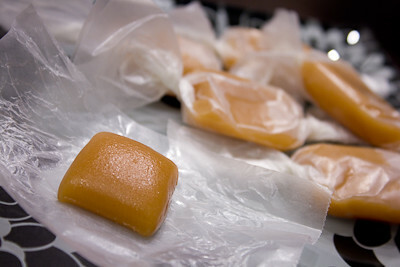 Hi Erin, these came right out of the wax wrappers w/o any issues... you should try them :) the honey flavor is wonderful!